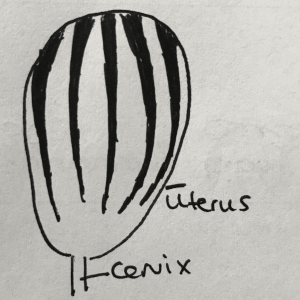 What does the uterus actualy *do* during labour? I’ll start by reminding you that I’m not medically qualified, nor a biologist, but I’m hoping my laymans terms (and super simple sketches…) will make this clear for anyone who reads it to understand what is happening with the uterus and cervix, during labour. It can be a complete revelation to many women, and really help reframe your expectations and interpretation of the sensations during labour when you understand what your body is actually doing during your surges (or contractions as you may know them – but doesn’t surge, or wave, sound like a much more manageable sensation, knowing it will build and then fade?). I’m still shocked that this stuff isn’t taught at school – to me it is far more essential for young women to leave understanding how their body functions, than understanding the formation of oxbow lakes or long division (both perfectly sensible things to learn, but relevant to a far smaller percentage of adult women, than how their reproductive organs *actually* work imo!). I was really surprised at how little I knew when I was expecting my first baby and started my own hypnobirthing course, and I know I’m not alone! So the uterus at the end of pregnancy had grown from around the size of a pear, to the size of a watermelon to accommodate your growing baby. It is made up of two layers of involuntary muscles, which means we have no conscious control over them, yet they work beautifully when you allow them to do their thing (just like your heart for example). Like many muscles in your body, the uterine muscles work as a pair (like your bicep and your tricep working together to bend or straighten your arm), there is an inner layer of horizontal muscles, and an outer layer of vertical muscles. 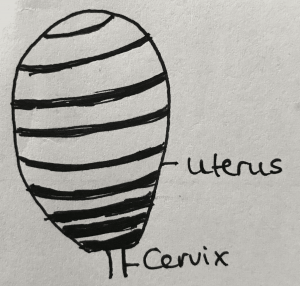 The inner layer is made up of circular bands of muscle, which are thickest, strongest, and closest together at the neck of the womb (or the cervix) and the bottom of the uterus. During pregnancy they help hold the uterus closed to keep baby safely inside. During labour, to facilitate baby passing through the birth canal, they must be drawn back and up out of the way. Yes yes I know – drawing is not my main life skill, just bear with me! The outer layer comprises of stronger, vertical muscles which are thickest and strongest at the top of the uterus. These draw up the circular inner layer during labour. When a woman is relaxed during labour, her body is able to let these muscles work in harmony; the vertical muscles draw up, and the horizonal muscles relax, open and move up. Now that you can see how the muscles move, its easy to understand why we feel a tightness or a lifting sensation during a surge – there is clever and powerful work going on inside. So what happens as these muscles move in this way – how does this help move baby down? Like me, you might be surprised to learn that that its less about hitting the magic ’10cm’ and more about your body moving these muscles from their starting place to their end position. Here is my (questionable!) 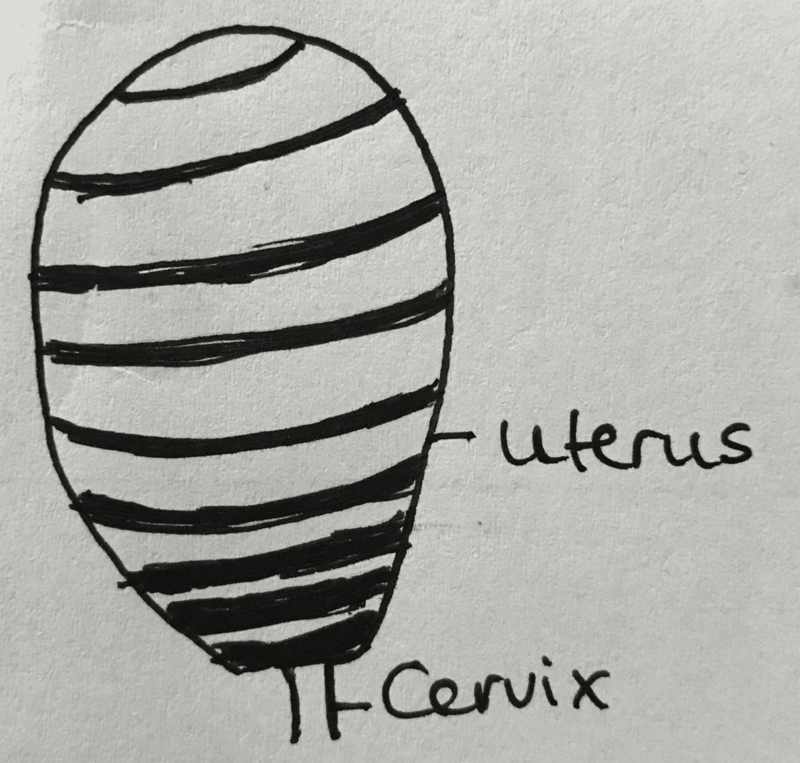 interpretation of a uterus at the end of pregnancy – there is no way I was trying to draw a baby in there too so please go ahead and use your imagination! 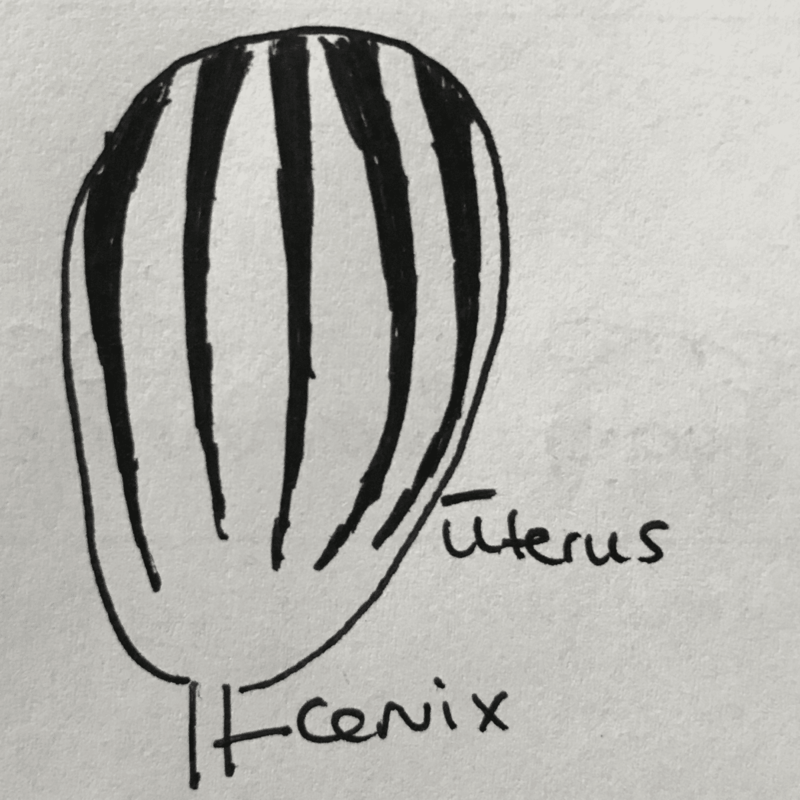 As the muscles draw back they create a thicker band of muscle at the fundus, the top of the uterus. 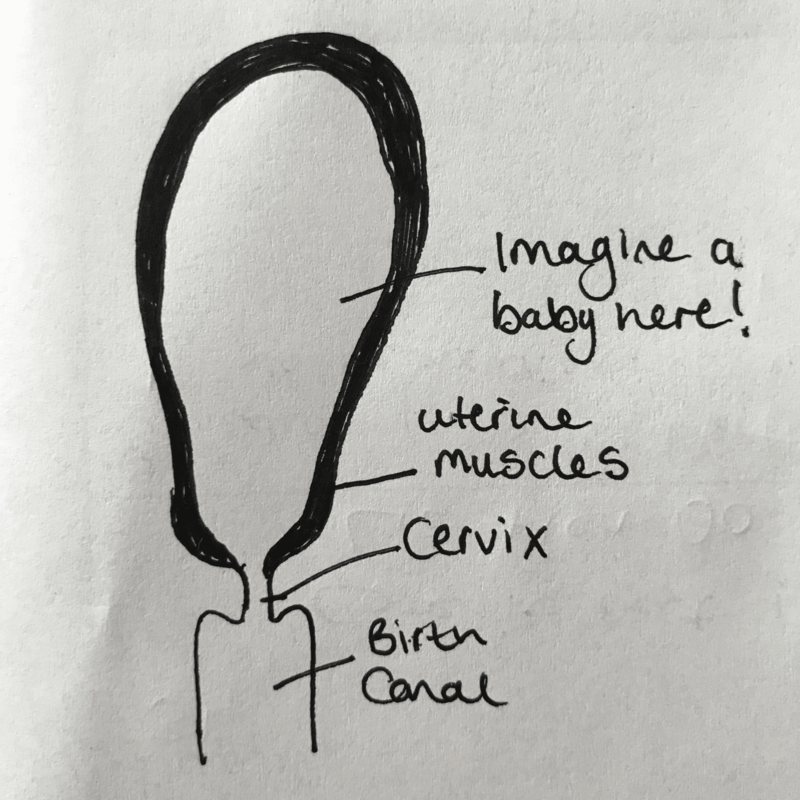 The layer around the neck of the womb has thinned and opened and the cervix has been able to dilate leaving the entrance to the birth canal free. 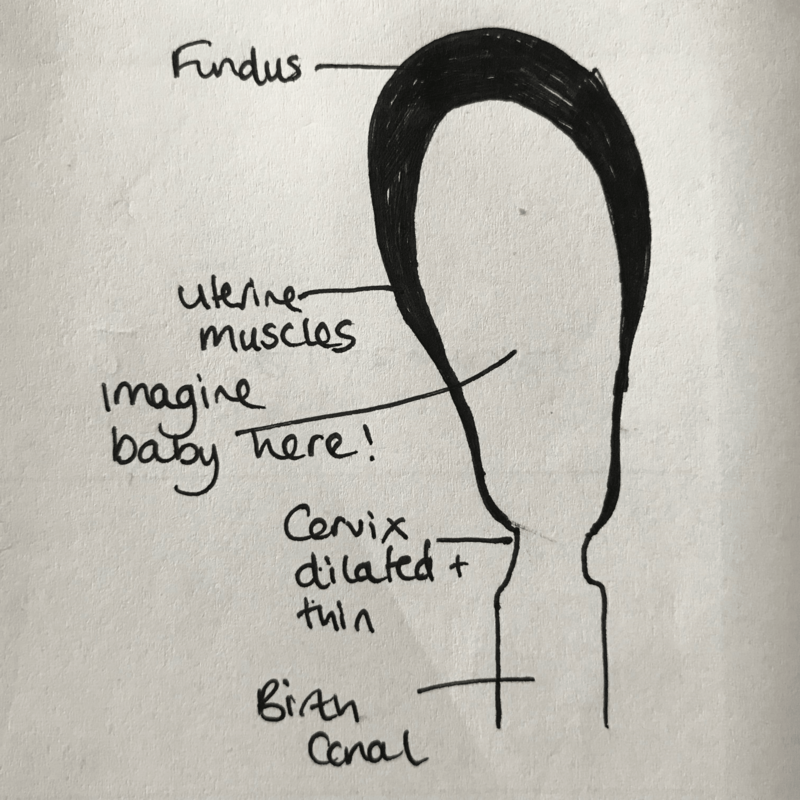 This is what we all hear of as 10cm dilated – it’s not actually always 10cm, I mean we all come in different shapes and sizes so why would our cervix be a size fits all job?! But it does mean that there is no cervix left blocking the way for baby to move down. Now back to that thicker layer at the top. It is this fundus which will work to push baby down and out, when birth is undisturbed this layer of muscle works like a piston to do that. It is called the foetal ejection reflex. So now you know this, how can you use the info to your advantage? Perhaps you can incorporate it into your visualisations during surges – knowing that your body is moving just as it is supposed to. You can use your breathing techniques and other calming tools with confidence knowing you are completely safe. This will keep your body in a state of calm relaxation, allowing oxytocin and endorphins to flow and these muscles to work harmoniously to birth your baby in the most easy way for you. If you are yet to do an antenatal course – check out our offerings. With something for every situation and budget your sure to come away feeling totally prepared and excited to welcome your babe into the world! I have limited availability which has come up for September for private courses – get in touch to discuss dates or read more here.